Drug overdose was the leading cause of accidental death in the U.S. in 2015. Although pain management after surgery continues to rely on opioids, there are concerns that ubiquitous use of opioids has led to a growing epidemic of addiction, dependence, and overdose (ODO). In a new study in The Journal of Urology®, researchers investigated to what extent patients who had undergone urological surgery later became opioid dependent or overdosed. Although the overall risk was low (0.09%, about 1 in 1,111 patients), several risk factors for ODO were identified. According to the study results, risk factors for ODO include younger age, inpatient surgery and increasing hospitalization duration, baseline depression, tobacco use, and chronic obstructive pulmonary disease. In addition, insurance provider, Medicaid or Medicare enrollment, and noninsured status were factors associated with ODO risk. The investigators also correlated ODO rates to specific urological surgical procedures, with stone procedures (0.15%) or major renal surgery (0.12%) having the highest rates, and major pelvic surgery (0.03%) and inguinal/scrotal procedures (0.05%) having the lowest rates. Using data from 2007 to 2011 for more than 675,000 patients from the Healthcare Cost and Utilization Project (HCUP) for California that included information on patient discharge, outpatient surgeries, and emergency department records, researchers were able to link surgical records to postoperative diagnoses of ODO occurring within one year of surgery. Comparing patients in whom ODO did or did not occur, those who overdosed were younger (median age 50 vs 62 years), more likely to be Caucasian (63.4% vs 57.3%) or African American (9.5% vs 3.6%), and less likely to have undergone ambulatory surgery (18.0% vs 57.8%) compared to patients who did not overdose. Patients who overdosed were more likely to have been diagnosed with depression (15.0% vs 3.4%) or be a tobacco user (28.2% vs 15.7%), and less likely to have cancer (17.2% vs 22.8%). For patients younger than 65 years who were on Medicare or Medicaid, and individuals who self-paid for insurance, the risk of ODO was 2.1 to 3.0 times higher than patients with private insurance. Medicare patients 65 years old or older were not found to be at increased risk for ODO. 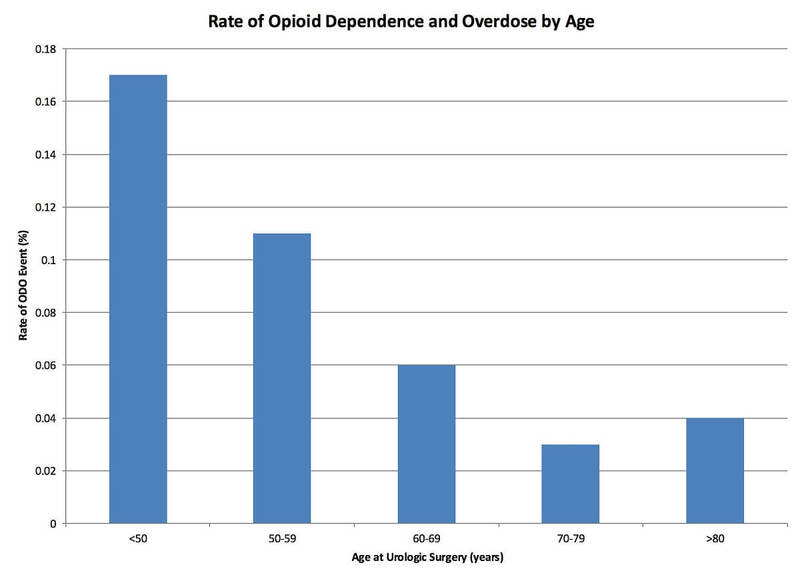 Rate of Opioid Dependence and Overdose by Age. Credit: Gopal N. Gupta, Loyola University Medical Center. In a Commentary in the same issue, Michael S. Leapman, MD, of the Department of Urology, Yale University School of Medicine, and Steven A. Kaplan, MD, of the Department of Urology, Icahn School of Medicine at Mount Sinai, offer some perspective on separating fact from fiction about opioid use in urology. “Opioid prescription is as deeply entrenched in the rituals of surgery as the act of donning gown and gloves. The ability to perform surgical interventions has always depended on the availability of analgesia, and opioids have long represented an indispensable component of care,” they write. Yet, with many studies showing the variation and extent of high dose opioid prescriptions and persistent use after surgery, there is a concern that urologists might be contributing to the opioid crisis. Drs. Leapman and Kaplan note that the study suggests that even brief exposures to opioids may result in problems for a minority of patients. But they also suggest that there are physicians who routinely dispense doses well in excess of recommended safety thresholds, patients who obtain multiple prescriptions within short periods (“doctor shopping”), and a confusing set of messages about pain management over recent years. The article is “Rates and Risk Factors for Opioid Dependence and Overdose after Urological Surgery,” by Arpeet S. Shah, Robert H. Blackwell, Paul C. Kuo, and Gopal N. Gupta, (http://dx.doi.org/10.1016/j.juro.2017.05.037). The editorial is “Commentary: Separating Opioid Fact and Fiction in Urology,” by Michael S. Leapman and Steven A. Kaplan (http://dx.doi.org/10.1016/j.juro.2017.08.064). They appear in The Journal of Urology®, volume 198, issue 5 (November 2017) published by Elsevier. Full text of these articles is available to credentialed journals upon request; contact Eileen Leahy at +1 732-238-3628 or jumedia@elsevier.com to obtain copies. Journalists wishing to interview the study authors should contact Jim Ritter, Media Relations, Loyola University Medical Center, at +1 708-216-2445 or jritter@lumc.edu. To reach Dr. Leapman for comment contact Eliza Folsom at eliza.folsom@yale.edu.